J. Kacen, J. D. Hess, W. K. Chiang. "Bricks or Clicks? Consumer Attitudes Toward Traditional Stores and Online Stores." Global Economics and Management Review, forthcoming, July 2013. 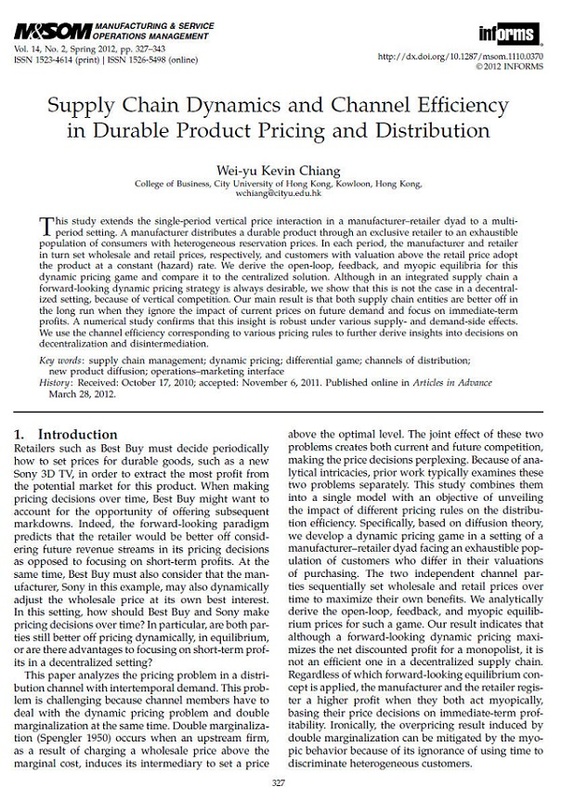 J. Zhang, W. K. Chiang, L. Liang "Strategic Pricing with Reference Effects in a Competitive Supply Chain." OMEGA - International Journal of Management Science, forthcoming, July 2013. Chiang, W. K., Y. Feng. "The Value of Information Sharing in the Presence of Supply Uncertainty and Demand Volatility." International Journal of Production Research, 45(6), 2007, pp. 1429-1447. Chiang, W. K., D. Zhang, L. Zhou. "Predicting and Explaining Patronage Behavior Toward Web and Traditional Stores Using Neural Networks: A Comparative Analysis with Logistic Regression." Decision Support Systems, 41(2), 2006, pp.514-531. X. Ke, W. K. Chiang, L. Liang. "Dynamic Pricing and Channel Efficiency in the Presence of Cost Learning Effect,” International Transactions in Operational Research, forthcoming, 2011. Chiang, W. K., Z. Li. 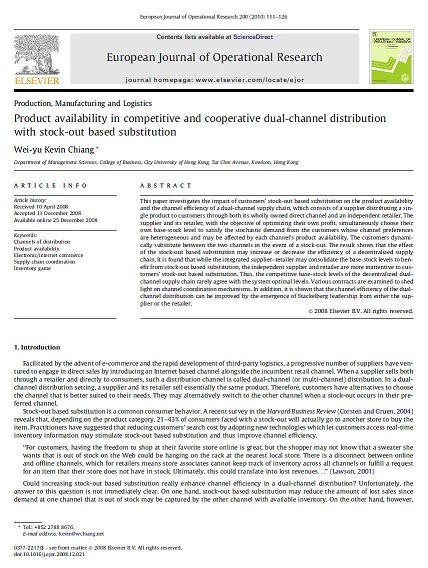 "An Analytical Hierarchy Process to Assessing Consumer’s Distribution Channel Preference." International Journal of Retail and Distribution Management, forthcoming, 2009. Zhou, L., W. K. Chiang, D. Zhang. "Discovering rules for predicting customers' attitude toward Internet retailers." Journal of Electronic Commerce Research, 5(4), 2004, pp. 228-238. Chiang, W. K., D. Chhajed. 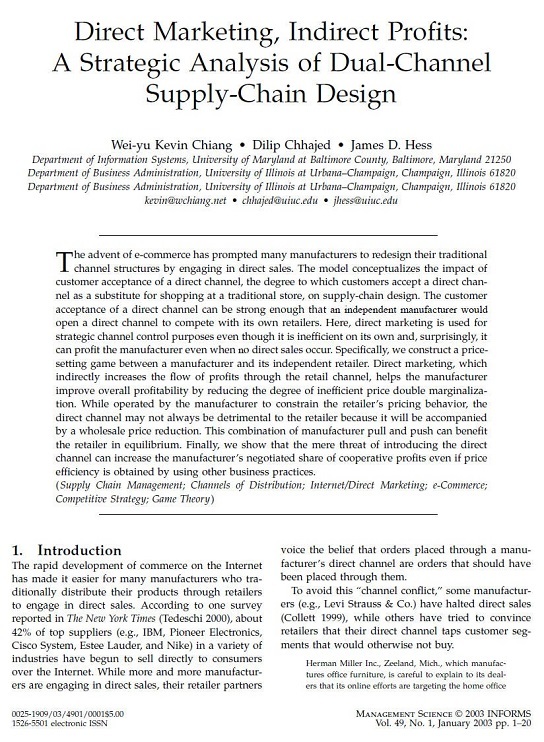 "Optimal Supply-Chain Channel Design in B2C Electronic Commerce." Supply Chain Optimization, Kluwer Academic Publishers, 2005. (editors: J. Geunes and P.M. Pardalos).